We've found that with some A3000 and TV combinations, using a standard cable gives a blank white screen. This is a special version that adds a 5V signal to the Scart 'Select' line, this fixed the problem on three TVs! It requires LK25 on the A3000 to be made (It is unmade by default but a jumper is normally fitted on one pin) The link is near the monitor socket, between the floppy drive and the back of the case. 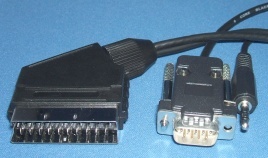 Can be used with A3000 to TV or Scart input monitor for RISC OS modes 0 to 17 + a few extra but not modes 20,21,27,28 or 31. Price: £24.00 no VAT to pay!